Tesla is currently offering test drives for the Model 3 Performance in selected showrooms across the United States. Key publications such as CNET‘s Roadshow also posted teasers about an upcoming review of the vehicle. Based on Neil’s report, the Model 3 Performance is being touted as one of the electric car company’s best vehicles as of date — one that can push Tesla to new heights. Neil’s positive review did not sit well with Tesla’s staunchest critics. His Twitter feed, for one, was quickly filled with vitriol. The comments section of his Model 3 Performance review in the Wall Street Journal were filled with much of the same criticism as well. 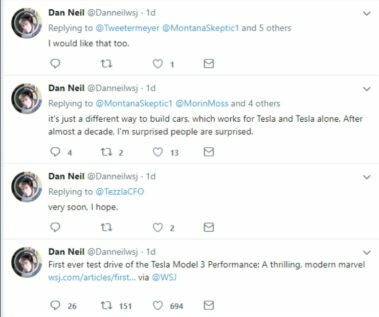 Neil defended himself on both places, and on Twitter, he ended up crossing tweets with some notable Tesla short-sellers, including Mark Spiegel and the vocal MontanaSkeptic1, who recently debated Tesla bull Galileo Russell on the Quoth the Raven podcast. Over the weekend, and amidst what appeared to be an overwhelming amount of negativity from Tesla shorts, Neil opted to delete his Twitter account. Fellow automotive reporter Urvaksh Karkaria posted a tweet later on claiming that Neil decided to let his Twitter account go because of the responses to his Model 3 Performance review. 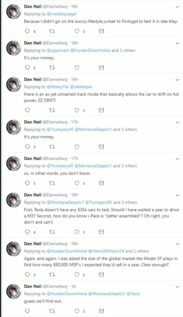 so #teslatwitter ran @Danneilwsj off Twitter. humans are so overrated. a damn shame, really. 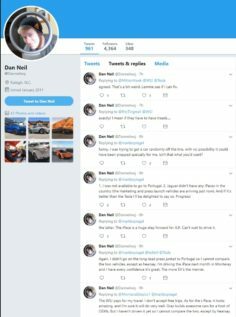 Screenshots of Neil’s final hours on Twitter were captured by members of the Tesla Motors Club, and from what could be seen in the images, the Pulitzer-winning journalist was engaging Spiegel and the MontanaSkeptic1 before he deleted his account. Both Tesla shorts seemed to have taken issue about why Neil has not reviewed the Jaguar I-PACE yet, as well as the $35,000 Standard Range RWD Model 3. One of Neil’s responses to Spiegel also gave the impression that the Tesla short was suggesting the vehicle given to the journalist was “prepped” especially for him (a notion that Neil described as having “no possibility”). Tesla might be controversial amidst Elon Musk’s occasional Twitter outbursts and the company’s tendency to meet its target timelines later than expected, but at the end of the day, the vehicles it produces ultimately speak for themselves. 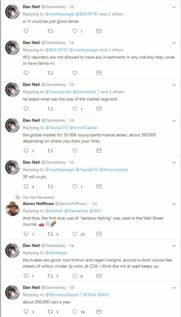 After all, professional reviewers like Neil, who are veterans of the auto industry, are praising the Model 3 Performance not because of Elon Musk’s rockstar status, but because of its own merits. And that, ultimately bodes well for Tesla.